Help an injured hunter avenge his fallen companions. Travel to Moss Mother Cavern. Speak to Valdr directly outside of it. Give Valdr anything he can use to help heal himself or heal him yourself. Help Valdr clear the spriggans out of Moss Mother Cavern, or do it alone. The first time you approach Moss Mother Cavern, Valdr will call out for your attention. He explains that he was attacked by spriggans living in the cave and needs immediate medical attention or he'll die from the spriggan's curse. After helping him, he will further explain that his companions had tracked an injured bear sow to the cave and were ambushed by the spriggans as they entered to kill it. Valdr was the only one to escape as Ari and Niels were killed before they could flee. He'll ask for your help to avenge his friends by killing the creatures. Valdr will offer to help you clear the caves. He uses a bow and becomes protected if he follows you inside the cave. If you don't want to risk him dying, you can offer to clear the cave alone. There are three leveled spriggans and a single leveled bear. The bear and a spriggan will be near the entrance; the other two spriggans are near the pool. It's possible to engage them individually; any sort of fire damage helps tremendously, though you may need to bring potions to mitigate their high damage output and ability to fully heal themselves. When all the spriggans are dead, Valdr will thank you and give you his lucky dagger which has a 25% chance to critically hit. He states he will return to Falkreath after he finishes burying his friends. Search the cave for a few scattered pieces of loot, including leveled boots, shield and a one-handed weapon. See Moss Mother Cavern for more details. If you are level 16 or above, you can ask the innkeeper at Dead Man's Drink about rumors and start the quest from stage 5. Valdr is not a protected NPC unless he becomes a follower during the quest so he may already be dead when you find Moss Mother Cavern. In that event, you will not be able to start the quest, even from the innkeeper. If you delay healing Valdr for any reason, he may die. If you head back to the road or wander off with him as a companion he'll stop following you and will return toward cavern saying in scripted comment:"Changed your mind? Well, I can't give up so easily. I'm heading back". Then leaves the script adding: "All right, then. ", "Hmm hmm." or "Until next time." But if you return too when approaching iron ore vein along the path he will rush toward you and start to follow again. Wandering off and returning again with him as a companion will produce the same action, though without scripted or any other comments now. One way or another, quest objective stays the same in your diary. 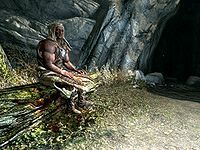 It might be advisable to accept Valdr's help if you are doing this quest at a low level, as spriggans and bears are some of the toughest enemies for low-level players. Valdr's Lucky Dagger is one of the better weapons in the game at low levels, particularly for assassin-type characters who value burst damage. However, it is outclassed at higher levels by items such as the Blade of Woe. Valdr may not accept anything besides a standard healing potion. Additionally, it may be impossible to interact with him in order to give him a potion. Healing him with Healing Hands spell may bypass this bug. At higher levels, Valdr may actually have enough health to be considered healed as soon as you meet him, and he will thank you for your help. Valdr should return to Falkreath upon completion, but sometimes disappears. The quest may sometimes be finished, but stay in your journal at the "Locate Valdr's hunting party" stage. The reward is given regardless. If you let Valdr initiate the conversation then talk to him before he finishes, but after you have received his lucky dagger, you'll receive a second one. ? If you choose to clear the cavern without his assistance, he may be hostile when you return to him. When attempting to view this quest on the map, it will incorrectly focus on the north section of the map. ? Valdr may not talk to you. Typing setstage dunMossMotherQST 30 into the console should fix this. The following empty quest stages were omitted from the table: 0, 9, 15, 20, 45, 60, 100, 101. On the PC, it is possible to use the console to advance through the quest by entering setstage dunMossMotherQST stage, where stage is the number of the stage you wish to complete. It is not possible to un-complete (i.e. go back) quest stages, but it is possible to clear all stages of the quest using resetquest dunMossMotherQST. This page was last modified on 24 January 2017, at 05:58.